3M Kind Removal Silicone Tape is a breathable, hypoallergenic medical tape with silicone adhesive. It provides reliable securement, kind removal, and gentle wear without compromise. 3M Kind Removal Surgical Tape offers reliable and pliable fixation and remains in place until you decide otherwise. It is comfortable and removes cleanly without disrupting fragile skin layers or causing patients undue pain. It can be repositioned and neatly torn by hand. 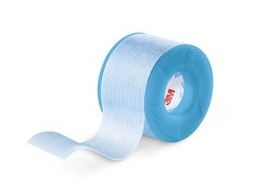 I was looking for a product that could be used to hold my husband's catheter in place in a skin delicate area of the body and I found this tape. Easy to tear and reposition. Not sure about the hold in water as nurses mainly take care of showering. All around great product.